Max Hermsdorfer, center, served as patient ambassador for Monroe Carell Jr. Children’s Hospital at Vanderbilt at the recent Nashville Predators Hockey Fights Cancer Night. 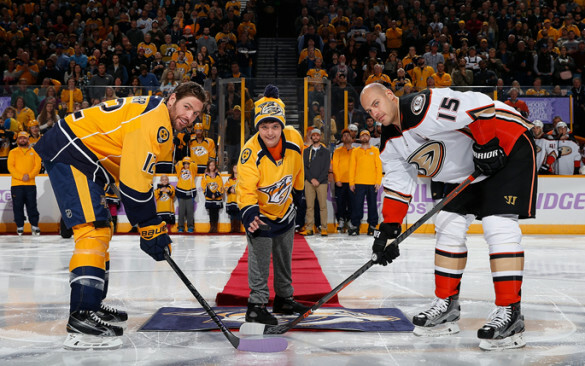 Here, Hermsdorfer drops the puck with Predators’ captain Mike Fisher, left, and Anaheim Ducks’ captain Ryan Getzlaf. Over the past seven years, the Predators have raised and donated more than $1 million to Children’s Hospital, with more than $500,000 going to the Nashville Predators-365 Pediatric Cancer Fund.